Newly-minted boat builders don't need to go down to the sea to drown. It's easier to drown in the sea of choices. The list of choices goes on and on, even as the remnants of the wooden boat population die off. In fact, the more I look into it, the more the words 'mass extinction' come to mind. Charles Darwin could have saved himself a lot of trouble with religious folk if he had studied the evolution of wooden boats, rather than life. As Greg Rossel points out in his book "Building Small Boats ", the ecosystem that boats live in is extremely diverse. Just consider the East Coast of the United States. Every creek and bay from the cold, rocky coast of Maine, to the warm blue waters of Key West is different from every other. If you made your living digging oysters in Long Island Sound, you needed a stable, shallow draft boat that was fast enough to get your catch back to market before your competitors. The flat-bottomed Sharpie evolved to meet the needs of fishermen who worked in this unique environment. But if you ferried people and goods on and off the ships coming into New York Harbor, speed was your main requirement, since the first ferryman to the ship earned the most money. 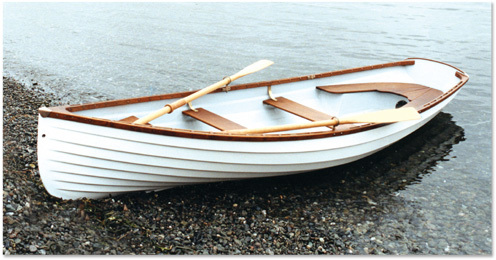 The round-bottom Whitehall rowboat was fast, tracked well, and could handle the harbor chop. These boats weren't present at the Creation. They evolved over time. And natural selection in boat design is just as brutal as in life. Successful boats returned to shore with their owners and cargo, unsuccessful ones didn't. So the designs that survived long enough for their lines to be taken down by Howard Chapelle and other boat historians were the best of the best. And although the evolution of fiberglass and mass marketing triggered a rapid mass-extinction in the wooden boat population, replacing them with homogeneous plastic boats, the classic designs still exist, ready to be brought back to life, like the dinosaurs in Jurassic Park. That's the good news. The bad news is that there are thousands to choose from. I start the selection process by making a list. 1. The boat I build must be short. Two reasons: the longer it is, the harder it will be to build and the more time and materials I'll waste if I fail. Plus, I hope this boat will eventually become the tender for a larger boat, and so will need to be short enough to fit on a cabin top. Thus, my boat must be a maximum of 8 feet long. 2. It must have a flat, rather than round bottom. 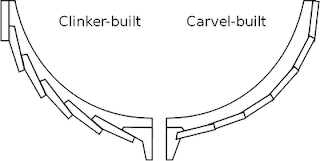 A flat bottom is much easier to build than a round bottom (every boat-building book I own says this, so it must be true!). I want to finish this boat in one winter, not end up with a half-built fiasco that my kids will tease me about till the day I die, so relative simplicity is important. 4. It must be both a good rowing boat, and a good sailing boat. 5. It must be beautiful, at least to my eyes. Over the years, I've discovered it's much easier to work on something you love. And even a small boat is a lot of work, both in the original build and in maintenance. A beautiful boat is more likely to get the kind of attention it needs. All these considerations got me looking at the designs of William and John Atkin, the designers who launched the long-range crusing life style with Eric, that later evolved into the famous Westsail 32. The Atkins (father and son) worked at the end of the wooden boat age, and thus could draw on the entire history of sea worthy work boats for their inspiration. Their designs have a serious looking 'chunkiness' to them that make their smallest dingy design look like it could sail around the world. And, in fact, I only looked at 5 designs before I found my boat. As soon as I saw her, I knew, that's the one. Or perhaps I should say 'him', because his name is 'Cabin Boy'. Cabin Boy's lapstrake sides and cross-planked bottom would let me practice both the traditional planking systems, and his spritsail gave him a jaunty look that I really liked. Just looking at this drawing got me thinking of sailing across a palm-fringed lagoon. So, choosing a boat design ended up being easy for me. Would it be as easy to build? As I inventory my collection of half-rusted hand tools, I doubt it. I'm amused at your 'spirit sail' typo. Ethereal propulsion! Buy a few, very good tools. Junk tools create junk boats. Good luck on the project. Came over to see from the Wooden Boat Forum. I always was a lousy speller. Thanks for the catch! Nice job recording you inner thoughts and feelings. This is going to be a blog that might make a fine book. Take good photos along the way. Photos start next episode when the build begins. Thank you. I will be following your blog from start to finish and enjoying your boat building trip from stem to stern. Interesting requirements. You know, I have a copy of the West System Bros. Boatbuilding book. It is thoroughly interesting. But the ones I am most facinated in are the tri hulls. And they are laminated. No lapstrake there. No leaks either, because they are covered with fiberglass. They are also durable, and repairable.